UNDERGROUND NASHVILLE: How did the idea for a mystery bookstore first come to you? MARY BRUSS: Greg and I were living in Macon, Georgia in 1995, and I was asked to help open a new Barnes & Noble store from the ground up. And I absolutely LOVED it! At about that same time, I read Death on Demand by Caroline Hart, in which the protagonist opens a mystery bookstore. “Wow!” I thought. “I could do that!” After that, it became our mutual dream. And at a certain point, years later, Greg said, “If you want to open that bookstore, you better do it now.” So we looked for mixed-development live/work units throughout the South, and Greg found Lenox Village online. When we saw this building, we fell in love with it. For us, it was like coming home, because we had lived in Franklin from 1978 to 1993 while raising our family. UN: Were you worried about opening a genre-specific bookstore when so many “general” bookstores have faded away? GREG BRUSS: In the five years in which we’ve been open, the market has actually shifted in our favor. When we opened five years ago, the #1 best-selling genre was romance. Now it’s what we offer: mysteries and thrillers. So that has helped. But more importantly, our attitude has been: We want to run a mystery bookstore. And as long as we’re having fun, and not losing too much money, we’ll continue to do it. UN: You have a devoted, growing customer base. What is the secret to that? GREG: For me, it’s Mary’s knowledge of mysteries. She is a great “hand-seller.” People come in the store all the time not knowing exactly what they’re looking for. Or the opposite, such as “I’m looking for an author who writes about Rhode Island in such-and-such way.” Mary is just excellent at helping both kinds of customers find the exact book they’ll love. UN: Who do you believe are the “best of the best” mystery writers working today? MARY: Louise Penny comes immediately to mind. She has written nine or ten books, and nearly all have won awards. She has a great way of turning a phrase, and we haven’t met anyone who does not like her books. Of course, there are many others: James Patterson, J.T. Ellison, Jennie Bentley, and Catherine Coulter. As far as writers of thrillers, I’d say Vince Flynn and Michael Connelly, who is up there with John Grisham. MARY: We consider ourselves very lucky to be doing this. Our customers are wonderful people and we’ve found, over the years, that most mystery authors are extremely open, friendly people, too. GREG: That’s exactly right. For us, it’s not about money. It’s not even so much about books. It’s about people. 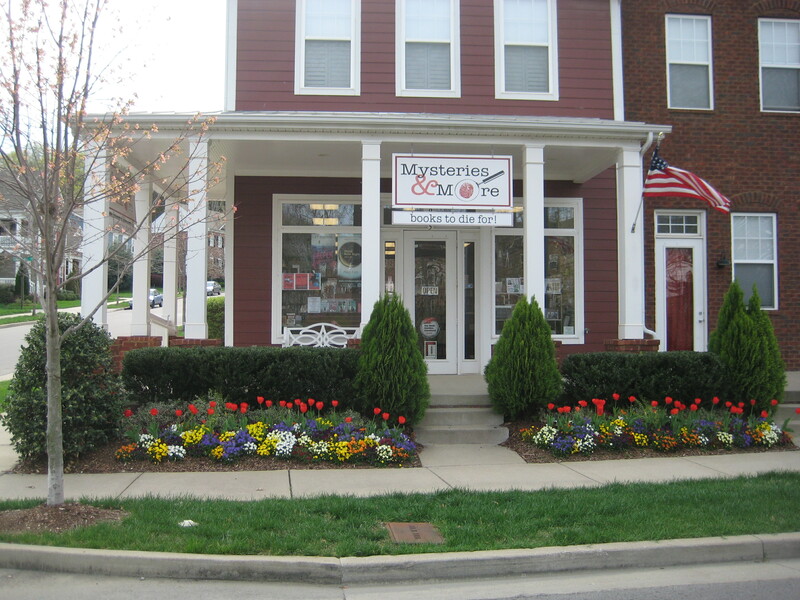 Later this week, Mysteries & More—the wonderful little bookstore in Lenox Village that is one of only two mystery bookstores in the South—will blow out five candles on its birthday cake. To celebrate this achievement, store owners Mary and Greg Bruss are throwing two big author-signing parties . . . and everyone is invited! On Saturday, March 30th, from 2 – 4 p.m., Agatha Award nominee Laura Bradford will discuss and sign Assaulted Pretzel, the second book in her Amish mystery series. There will be birthday cake, assorted beverages, and snacks, along with some special sales and valuable drawings. On Thursday, April 4th, from 6:30 – 8:00 pm, the husband-and-wife team of Joyce and Jim Lavene from North Carolina drop by Mysteries & More. These nationally bestselling authors have written more than thirty mysteries in seven different series. They will discuss and sign the first book in their new Sweet Pepper fire-brigade mystery series, written under the pseudonym of J. J. Cook and entitled That Old Flame of Mine. To satisfy evening hunger pangs, the bookstore will offer wine and hors d’oeuvres, plus other refreshments and snacks. Editor’s Note: Our exclusive ‘Underground Nashville’ interview with Mysteries & More owners Mary and Greg Bruss will appear later this week. Black Mountain Breakdown by Lee Smith is a cautionary tale featuring the protagonist, Crystal Renee Spangler, an intelligent, beautiful, and gifted young woman. Because of tragic experiences—she is raped on the same day her father dies—and poor moral choices stemming from a desperate desire to be loved—she suffers a debilitating “nervous breakdown.” It’s not a pretty picture, but is told in fascinating, colorful detail, with artistry, creativity, and memorable poetic language. Black Mountain Breakdown, like Ms. Smith’s other novels—such as The Devil’s Dream and Oral History—portrays the often-eccentric people who eke out a hard-scrabble living in the various “hollers” (sic) of Appalachia. Ms. Smith has an acute ear for Southern dialect and a perceptive eye for her characters’ hopes and dreams, their religion (or lack of it), their laughter and tears, their stoic endurance through difficult times, their flaws, faults, and foibles. Anyone who loves the genre of Southern literature should appreciate and enjoy the artistry of Black Mountain Breakdown. Lee Smith was born in 1944 in Grundy, Virginia, a small coal-mining town in the Appalachian Mountains. The author of eight novels (critics esteem her novel Fair and Tender Ladies as her best) and two collections of short stories, she currently lives in Hillsborough, North Carolina. Rachel Solomon’s Love Ourselves is a seven-song meditation on the hues and shades of love. Pulling her R & B-flavored piano pop from a full palette of emotion, Rachel delves into the musical waters of love with an honesty and authenticity rarely heard in today’s pop. The result is one of the finest debut albums in recent memory. What makes this record so special is its courageous vulnerability. Part of the art of songwriting is to determine how much of a mask you’ll wear as a writer. Rachel Solomon would seem to wear none at all, creating pop reflections that are singularly captivating because, in part, they are so bravely open and honest. This is an artist who cares deeply about love—so deeply she’s able to reveal it to others and ask for it herself. The official CD Release Party for Love Ourselves will be on Wednesday, April 10 at 6 p.m. at 12th & Porter. Admission is free. UNDERGROUND NASHVILLE: What were you particularly thinking about or feeling as you wrote the songs for Tell the Truth? JILL SISSEL: I began this blues project in the fall of 2011. Before that, my co-writer Mike Kuhl and I had written “Minimum Wage,” and, as we wrote it, I sang it in first person. Next, I began to notice things were breaking, falling apart. My car broke down, my AC unit went out in the house, and I started to freak. I remembered wondering why was I so drawn to the blues? I had always written positive, uplifting, and sometimes sad love songs, but the blues went around the corner, man. I found the culture so primitive yet so free. This paradox kept driving me on, so I bought a book by William Ferris entitled Blues from the Delta (Anchor Books, 1979), and marveled at the symmetric nature of the “blues man” and the preacher man. Both had driving forces that the layman thinks is Good vs. Evil. I mean, the very duality in human nature is expressed in the blues, and this is what I was feeling. I broke out of a box of conformity, I cut up my credit cards, I quit cable, I sold my comfortable home, and moved into a smaller space to live within my means. The illusion went away and the blues moved in to stay. UN: How did those thoughts and feelings affect the album and/or make it distinctive? JS: I became a pilgrim of the blues and my partner and producer, Liz Ficalora, and I went to the Delta. We went down to Clarksdale. I had to go. I went to see the first one-strand in the Delta Museum. It’s the first slide guitar! Muddy Water’s original cabin is reconstructed, and on the outside was the one-strand. I felt like I had seen the Holy Grail. So as I continued writing the songs for the album, I started to express and focus on the inequalities in my own life, as I experienced them. I wrote the song “Sticks and Stones” after someone told me they hated me because I was gay. What do you say to that? The story “Change” came when Mike Kuhl had seen a homeless veteran downtown and he didn’t need just loose change, he needed real change in his life and the societal attitudes of homeless people. I just started listening to the sounds of oppression, and giving it a voice. It’s not unique, but it was a first for me. I usually write “to the solution,” but this time I wasn’t afraid to see my shadow side and embrace it. UN: What do you feel is MOST important for people to know about Jill Sissel as an artist? JS: I guess I would want people to know that not everything is as they see it. I certainly am a walking contradiction, and that tension and dynamic is what makes me who I am. I honor the souls who reach beyond their comforts, and when expressing something like a song, they make someone think and see something from another’s perspective. I always write what I know. I want them to know me as a seeker of truth. Looking for a great, affordable website? That’s the guiding idea behind Just Ducky Designs, the website company run by local good guys Kelly and Eric Normand. In this exclusive interview, Underground Nashville talked with the Normands about their breath-of-fresh-air website-creation company. UNDERGROUND NASHVILLE: What does Just Ducky Designs do, exactly? KELLY AND ERIC NORMAND: We design, maintain, and host websites; provide search engine optimization; design logos and online flyers; write content; and build e-commerce websites with online payment systems. We also redesign existing websites, pretty much all aspects of web design. UN: What is the most important benefit you offer your customers? THE NORMANDS: At this point in time, a lot of small-to-midsize businesses are implementing their first professional website, a process which can be daunting and often extremely expensive. We believe this process can and should be relatively easy and affordable. We make sure that every website we build reflects the unique personality that is at the heart of every business, product, or person. UN: How long have you been in business? THE NORMANDS: We built our first professional website in 2004 for Nashville touring and session drummer, Jack Gavin. Since then, we’ve built over 100 websites for a wide variety of businesses and clients all over the country. UN: Why did you start promoting the business more actively in the past few months? THE NORMANDS: Over the past couple of years, Eric has been slowly transitioning from being a full-time musician to someone who actually lives in the real world. And web design seems to be a natural fit . . . [laughs]. In all honesty, we love what we do and we’re good at it. We believe in karma, and that we can only succeed if we help others to succeed. UN: Why do you believe musicians and others should come to you rather than to one of your competitors? THE NORMANDS: As a husband and wife website design team, we have a unique background: Kelly is a computer whiz and has been working with computers since the early 80s. [Eric] has been a professional musician since 1989 and also has delved into writing and photography, authoring his first book in 2011. So you could say our company is one part computer geek and one part artist, the perfect combination for building creative platforms on the web. We believe in honesty and integrity and post active links to the websites we build, as well as our rates, right on our company site. We consider ourselves “the Jerry Maguire of web companies,” placing an emphasis on personal attention. If you’re like me, what you DON’T understand about car, home, and business insurance could pretty much fill LP Field. That’s why I’m so grateful that my friend Dave Yates handles all my insurance for me. Over the past six years, Dave has been an amazing ally “in my corner”—helping me understand what I need, what I don’t need, and how to get the best insurance value for my dollar. And he delivers all that with second-to-none personal service. This advertising refrain has been a pet peeve of mine over the years because it very cleverly tells you absolutely nothing! Why? Because EVERY insurance company can make that claim. They’re only counting the savings of people who DID switch to them, NOT everyone who received a quote. They don’t mention that many more potential customers decided not to switch because they would have paid an average of $468 more! There’s far more to insurance than just saving money! I majored in Advertising in college, and love to analyze ads in all media to see what makes them tick. And all these price-focused insurance ads really tick me off! They’d have us believe that buying insurance is just like buying a box of cereal, where flashy packaging and low price is all that matters. As I’ve said in this blog before, insurance is not a commodity, and shouldn’t be purchased in 15 minutes online or with a 1-800 number. Companies are different, coverages are varied, and it is essential to discuss your individual insurance needs with a competent insurance agent here in Williamson and Davidson counties who is familiar with, and who cares about, your specific situation. Like me, for instance! You are currently browsing the Underground Nashville blog archives for March, 2013.